The Episode starts with Sukha asking Preeto to leave from there. Preeto asks him to listen to her once, but he don’t listen. Soumya takes preeto with her. Gurmeet asks Sukha why did he melt down seeing Bua. Sukha says your bua is a tigress, I have to act to melt so that she becomes relaxed and we can do our work. Preeto comes home and asks Veeran to tell truth and tells that years ago you was involved with Sukha. Veeran asks what are you saying? Shanno says they will not believe you. Harman says it is difficult to believe you, but still giving a chance to say. Shanno says you had trusted Veeran before then why you are doubting him now. Harak Singh scolds her and asks everyone to go to their rooms. Raavi asks Soumya to make Soham sleep. Raavi asks Preeto what had happened there? Soumya worries and tells Harman that Sukha mama can harm you, Papa ji or Soham. Harman says you don’t need to be scared when I am here and asks her not to worry. Raavi asks Preeto if she really thinks that Mama ji melt down. Preeto says no and says he is silent for sometime. She tells that Harak Singh needs to accept Soham, if he shakes hand with Sukha then it will be a problem. She says we have to do something. Next morning, Preeto takes baby Soham from Soumya and begins talking to Soham infront of harak Singh. She tells that your Dada ji used to make me have badam milk from his glass, but now he is not asking. Harak Singh asks her to drink and make it sweet. Preeto gives Soham to him and drinks the milk. She tells that she will make the baby drink dry fruits milk so that he gets habitual to their habits. Harak Singh says this is fake grand son and tells that it will not become real. He gives the baby to Preeto. Preeto keeps the baby on the sofa and asks Soumya to bring milk. She tells Harak Singh that he made toys all his life and now letting a baby crying. She says you will not go anywhere. Harak Singh says I am understanding your mischiefs. Preeto asks him to throw the bottle and leave the baby, else take the bottle and feed baby. Harak Singh lifts the baby and makes him drink milk. Soumya cries happily. Preeto smiles. 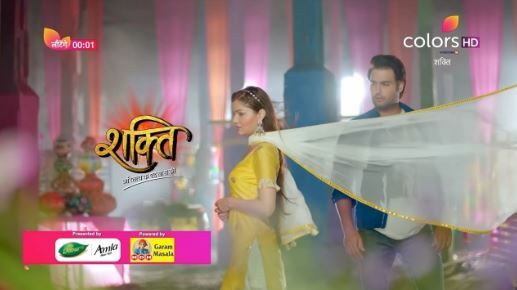 Harman comes back home and is happy to see Harak Singh feeding milk to the baby. Soumya comes to her room and thanks Mata Rani. She tells Harman that Papa ji lifted Soham in his arms and fed him milk. Harman says I have seen and tells that I know my father well, he is like a coconut, delicate from inside, and hard from outside. Soumya says I will not be sad if Papa ji don’t accept me, as he is accepting Soham and hopes he regards Soham as his grand son. Maninder and Varun meet the lawyer. Maninder asks about the custody of the baby. Lawyer asks him to give him sometime. They come out of the lawyer’s office and see Sukha in the jeep. Sukha gives them something. Varun asks who are you? Sukha says this is a paper and asks him to write his wishes in life, and then I will write about my wishes. Varun says my mood is already bad and asks him to play with someone else. He asks Maninder to come and is about to walk away. Sukha calls Varun and says our wishes can meet somewhere, and says example, Harak Singh will be ruined and they will get the baby. Preeto comes to Harak Singh and thanks him for accepting the baby. Harak Singh says he did that for humanity sake and have never accepted Soumya as his bahu. Preeto asks him to take baby and enlighten his mood. Sukha gives his intro. Varun identifies him. Sukha tells that they shall sit and talk. Preeto asks Harak Singh to make the keys of toys room for Soham and says I am sure that you will feel proud seeing Soham playing with toys which were made by you. Harak Singh gives the keys to Preeto. Preeto gets happy and emotional. Varun and Maninder go to Sukha’s room. Varun says you made entry at right time. Sukha says so it is decided that you need the baby and I need Harak Singh with his family. Maninder says I just need my grand son and asks him to tell what he thought to do. Preeto and Raavi take the toys out of the toys room and call Harman and Soumya. Soumya brings Soham. Preeto tells that Soham’s Dada ji has given the toys for him. She asks Soham to play. Harak Singh comes there. Preeto tells Soham that every toy is made by his Dada ji. Veeran and Shanno come there. Preeto asks Harak Singh to come to front. Harak Singh shows the toys to the baby happily. Preeto tells Harak Singh that they will get the chair to have food. Harak Singh says ok. Harman clicks their pics with Soham. Harak Singh is happy as well. Soumya tells Soham that she will be with him all his life and will lighten his life and asks him not to let her away from him.